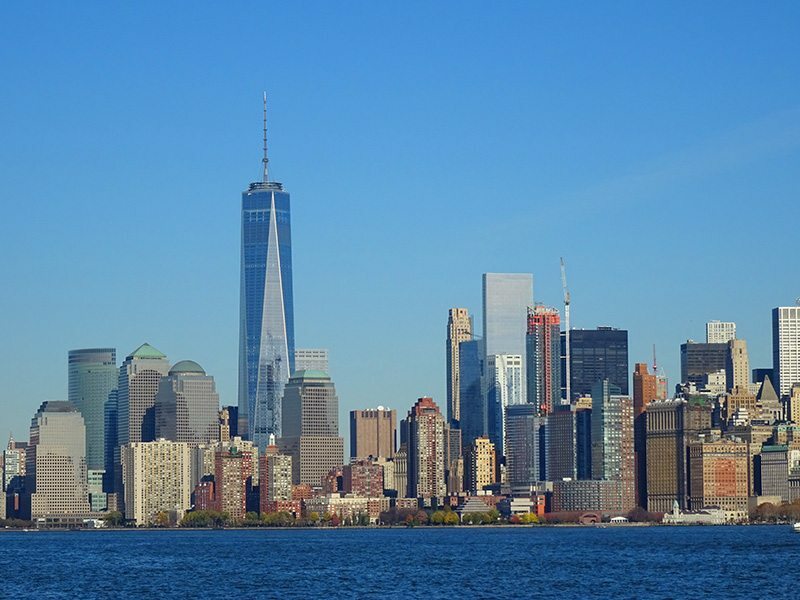 A reader recently asked us how to spend Three Days in New York City after reading our article, It is OK to be a tourist in NYC. Now that it a lot of pressure, as the city has so much to offer. We came up with this full-on three day itinerary, and hope we have done justice to giving them some memorable experiences in the Big Apple. This is a very energetic itinerary, but we are hoping that people can make some choices from our recommendations. There are options included as well as some extra suggestions at the end to swap and change the itinerary around. There are more NYC travel tips here. 1.2 Head to Times Square. 1.4 To get a MetroCard or not? Buy a New York CityPASS because it saves you a lot of money on entry fees to lots of iconic sites, which we will be recommending you visit. It will cost adults $114US, but will save you a lot of admission fees, and skip the line/queue privileges, and trust me you want that. If you come from the JFK airport, the easiest way is the get a flat rate taxi, at $52US, though it comes to $59US once the toll at the Manhattan Bridge. Of course, Uber is also a popular choice, and we did try the Super Shuttle. This shuttle service was perfect in San Francisco, but we waited for a long time for other passengers at JFK, which is a pain but at $14US a consideration. If you come from Newark airport, the taxi rates are metered. A better way is to get a shuttle that comes in at about $50, or the Super Shuttle. If you arrive by train at Penn Station, or by bus at the Port Authority, you need to consider whether it is better to walk or to grab a taxi. The traffic in NYC can be slower than you dragging your bags through the crowds. With a limited time, you want to be in a central position yet not is such a manic area that you feel overwhelmed when you walk out the door. Because we recently had five wonderful days in New York City, and a couple of days later in our road trip in the USA and Canada, it is with great confidence that we recommend The Paul Hotel NYC. This is a hotel that is way bigger than the shoeboxes that you get in NYC, particularly if you get the Terrace room. The Paul Hotel NYC is located in a district called the NoMad Neighborhood, which is nestled between Madison Square Park and the Flower District. It was perfect for location, perfect for service and perfect for NYC ambience. If that doesn’t suit, there are lots and lots of hotels in New York City to fit your need. Check out prices here. The reality is Day 1 is getting to the hotel, and settling in. Now it is time to see what all the fuss is about, by going to what are two of the most iconic sites in the city. This is where you can overdose on neon signs, advertising, naked cowboys, cartoon characters who will try and rip you off to get a photo with them. This is where you can go selfie mad everywhere and gaze at the ball that comes down to signal the start of each new year. 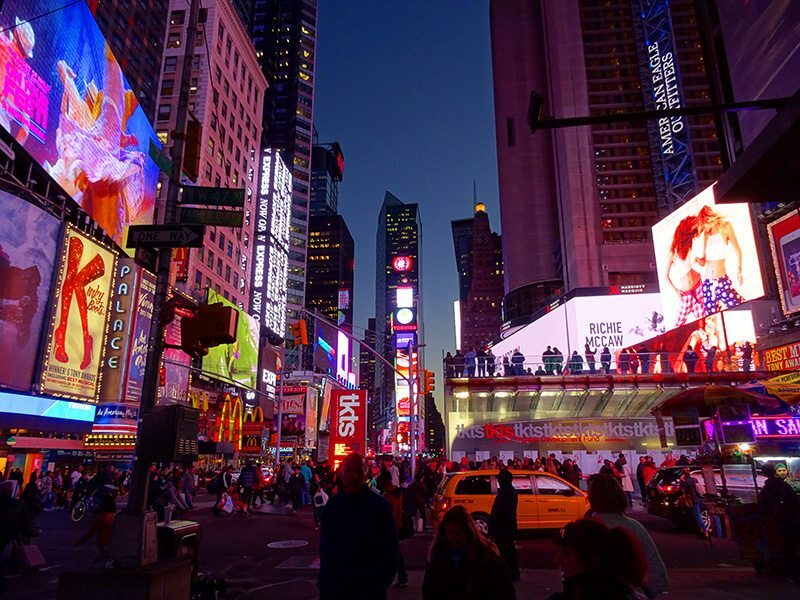 Times Square is busy, frenetic, crowded, colourful and one of the best introductions to the city that never sleeps. As the city that never sleeps, after you have gazed in total amazement and astonishment at Times Square, head to Grand Central Station. Why would we send people to a train station when they have just arrived? Because New York’s Grand Central Terminal is so much more than a train station, and Penn Station and Grand Central Station are two different places. 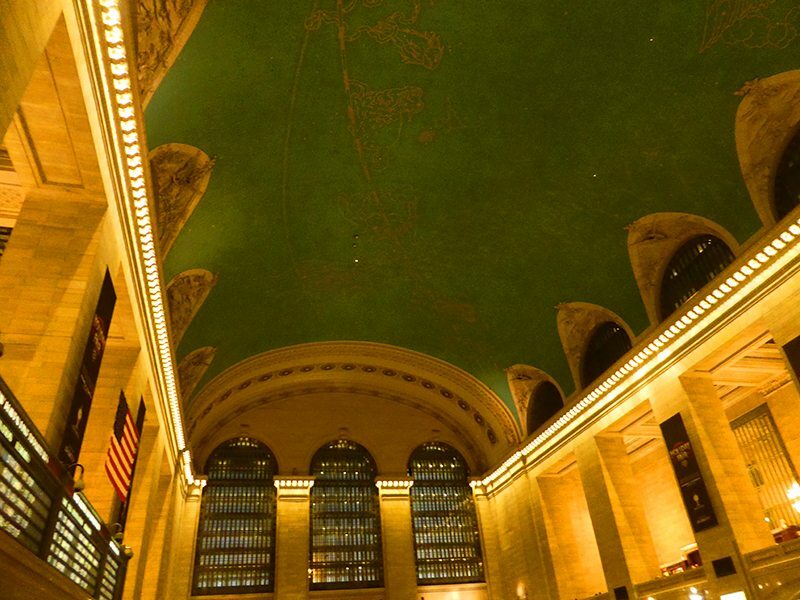 Grand Central Terminal is a work of art. You and many others will gaze t the ceilings transfixed by the opulence of this train station and know why it is called grand. You should then treat yourself to some oysters at the Grand Central Oyster Bar & Restaurant, and start people watching, as New York City was made for this pastime. To get a MetroCard or not? While you are there, you might like to get yourself a MetroCard, because even though you will do a lot of walking, sometimes you will need to catch the metro to give yourself a break. If you have children, this would be a definite factor.The cards come at $31 for a 7-day pass, or wait and do the Pay-Per-Ride, which costs $2.75/ride when you purchase multiple rides. Otherwise, it costs $3 per ride. Get up early and make your way Battery Park, NY to catch the First ferry from the mainland at 8:30 am. There will be a long queue, all day every day. Use your New York CityPASS. It will take about 3 hours to see both. The Statue of Liberty has to be photographed, and Ellis Island is where you will learn about the immigrant experience coming to the US. To save queuing, and the queues are long, get your tickets beforehand. If you just want to see the Statue of Liberty, then take the Staten Island Ferry, which is cheaper and gives just as good a view of the Lady Liberty. The Ferry runs 24 hours a day/ 7 days a week. After you have seen the Statue of Liberty and Ellis Island, meander through Wall Street, the financial district of NYC. 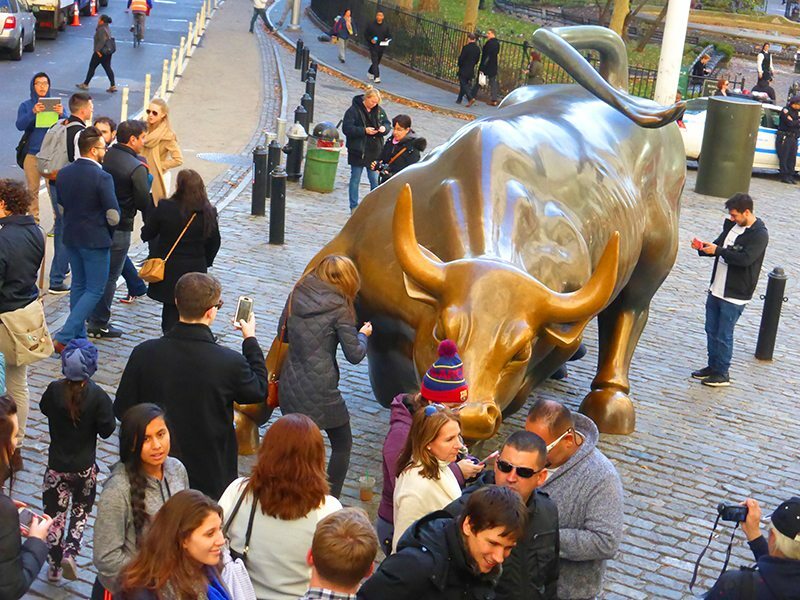 Take a selfie with the bull, because it is NYC and NYC is selfie heaven. And if you rub the bulls appendage, it will theoretically bring you good luck and fortune. Eat at Adel’s Halal Food stall, cnr. of Front St and Maiden Lane in the Financial District and try the chicken, lamb and falafel combo on spicy rice. Go to 5th Avenue, which is lined by high-end fashion stores, such as Prada, Armani, Versace, and Gucci. The enormous Apple store is also located on 5th Avenue. Visit the Metropolitan Museum of Art. It is located on the Museum Mile on 5th Avenue. As the biggest museum in both North and South America, it can become easy to get immersed in the collection.. 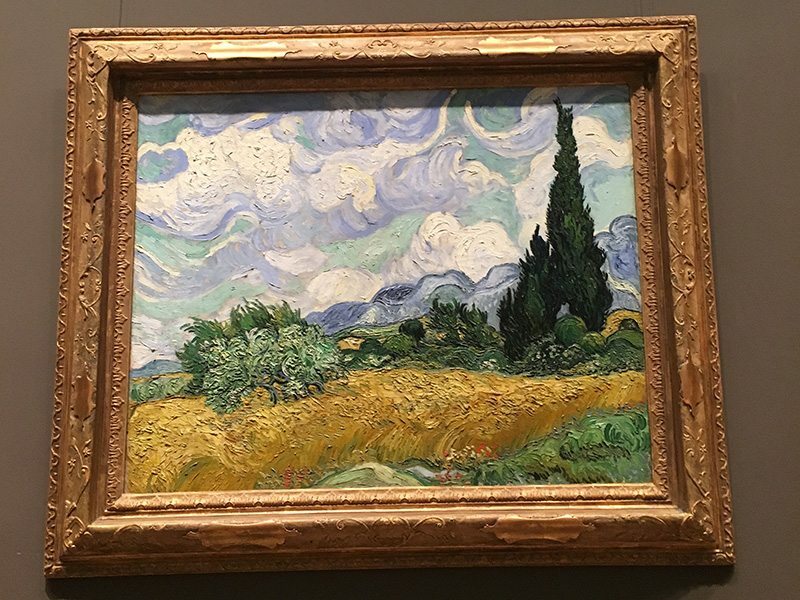 The museum’s massive collections include paintings by Vermeer, Van Gogh, Monet and Rodin. MoMA is the Museum of Modern Art and is full of some of the most incredible and bizarre modern arts. It is well worth the visit, and id time were not an issue, see both the MET and MoMa. Remember MoMA is free on Fridays between 4:00 and 8:00. Many cafes around and within both the Met and MoMA. 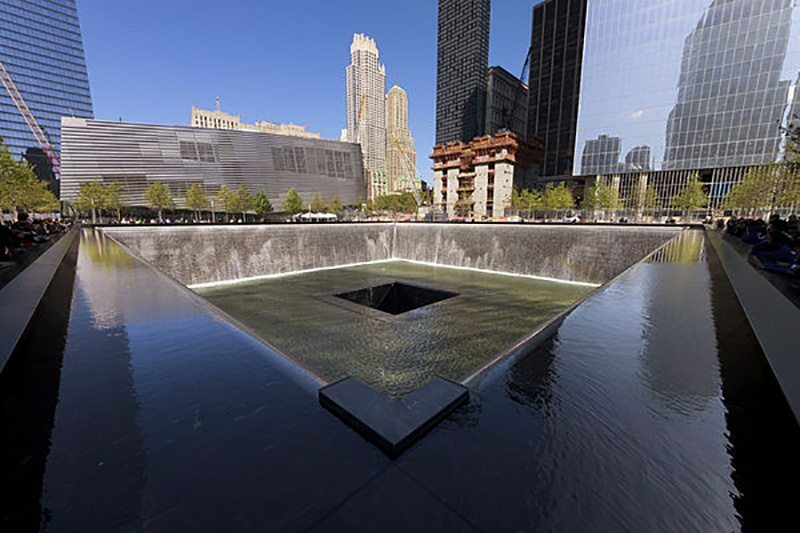 Visit the 9/11 Memorial Museum, included in you CityPass. The historical exhibition has three parts: the Day of 9/11, Before 9/11 and After 9/11. It is a moving experience, but well worth while. Buy tickets to skip the line for this experiences. 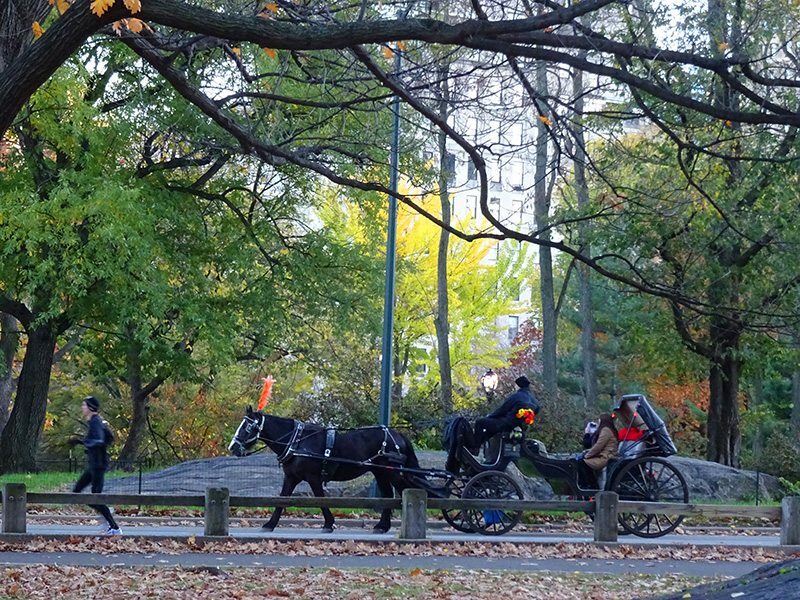 Take a leisurely walk, or catch the subway to Central Park, the city’s green lungs. Spend the afternoon walking around, enjoying the contrast that the park provides to all the surrounding skyscrapers. Watch some street performers, sit down on a bench next to a picturesque lake or try to see all the sculptures and monuments in Central Park. Have a nice break and see the characters that make up the city. 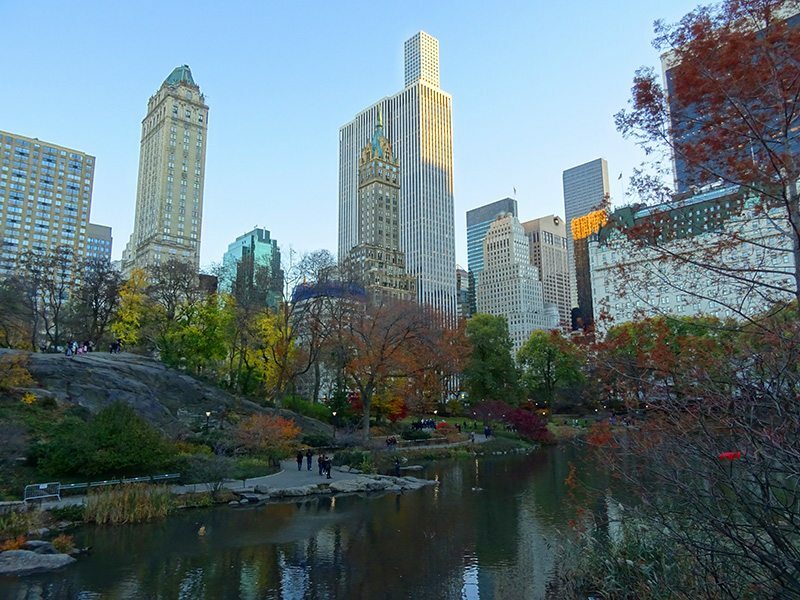 Be really decadent and do a helicopter ride over Central Park. Eataly is the largest Italian mecca of cafes, deli, restaurant, and groceries at 200 Fifth Avenue. You will be overwhelmed with the choices, but you cannot go wrong with anywhere you choose here. Use your New York CityPASS. Get a skip all the lines pass, you will be happy.This historic 1930s art deco building is a landmark in New York City, and the views of an evening are spectacular. Address: Fifth Avenue between West 33rd and 34th Streets. Visit the American Museum of Natural History – if you have seen the movie, Night at the Museum movies you will know this place. Walk the Highline – the converted train track that is now an urban walking park. 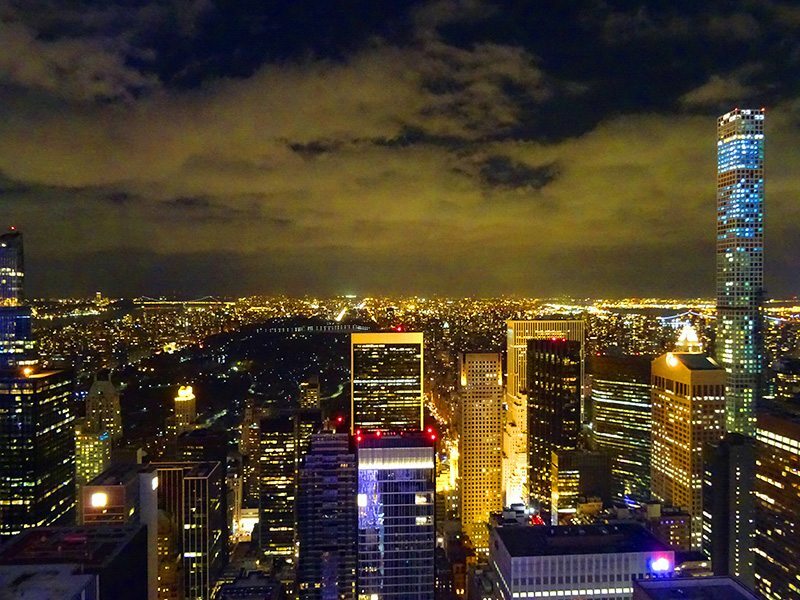 Take the Night-Time bus tour – and see New York City in all of its glory. This is a big and exciting city, and a city with endless things to see and to do. 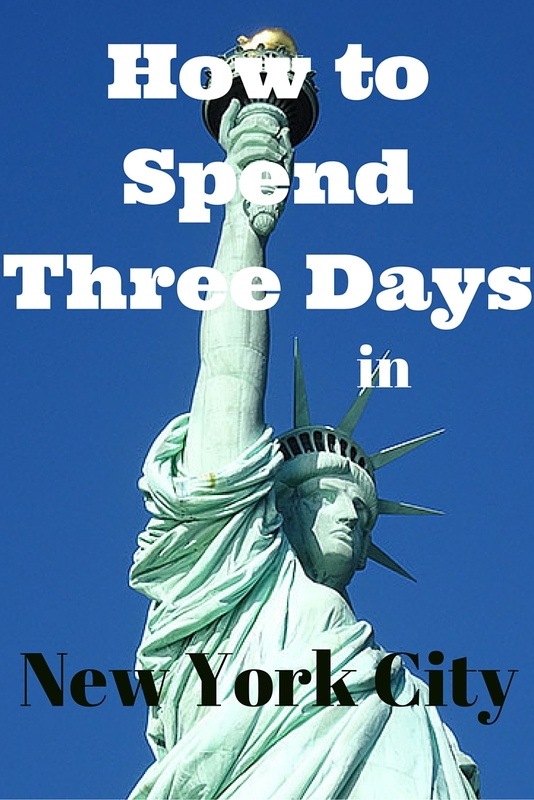 This is a suggested itinerary for How to Spend Three Days in New York City. I was going to bring up the Brooklyn Bridge (but then saw you managed to mention it at the end). And, also, not too far from Grand Central is the NY Daily News (until it folds)- which has the iconic sculpture in front. Those that are old enough will recognize it as the symbol for the Daily Planet of Superman fame. Daily Planet is an excellent addition. Do you mind if I update article with this suggestion? Like everybody else, I just love New York!! 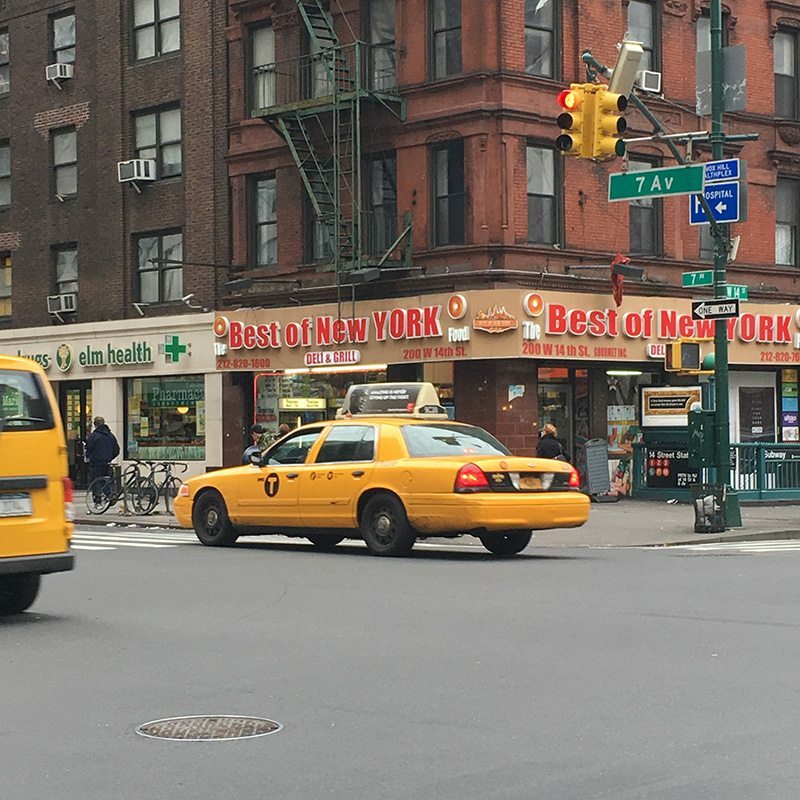 Last time I stayed out in Brooklyn – superb! I would like to go there next and explore it a bit more. Very busy itinerary, Paula. It seems you like New York and you covered a lot in three days. Thanks Michela, it will be a city will return to for sure. I love NYC! Jim and I go every time we’re on the east coast visiting family. We usually only do one day and maybe a night, though, because it’s a lot of pavement! We loved the vibrancy of the city too, and we will return. I’m planning on going to New York at the end of this year, so this guide will come in handy. The Paul looks like a great place to stay. Thanks Eileen, totally recommend The Paul hotel. Have fun. You will. Having done many trips to NYC I think your guide is perfect. Thank you, that is lovely of you to say. It can be done cheaply ..once you are there. Thanks for such a jam-packed intinerary! An American road trip is on mine and my boyfriend’s list of dreams, so it’s great to know how to make the most of NYC! 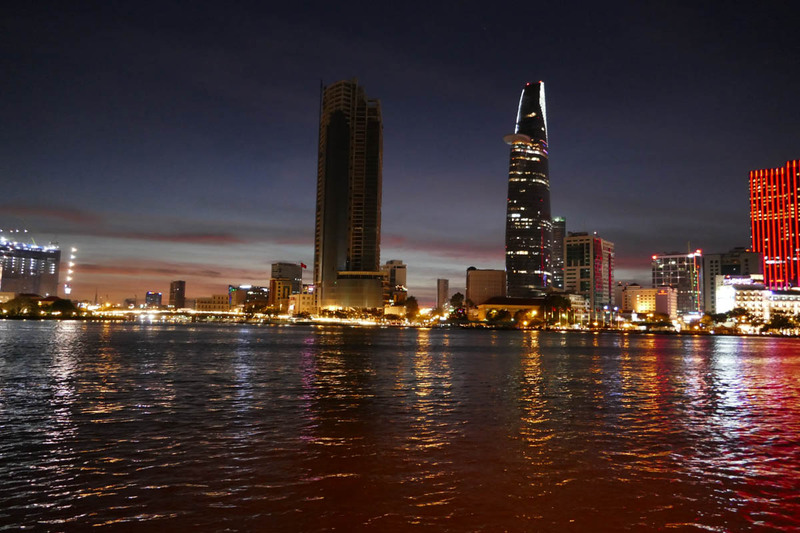 You will love this 24hr city. Thank you. Just beautiful. Oddly I had never ever had a desire to visit NYC – but your blog post has changed that. You must visit, it is an exciting city. It will amaze you. Definitely an issue. I always recommend using the hop on hop off bus, and doing full loops to get your bearings. Plus, you learn so much. Then go off and explore on your own. Thanks Anna, it is a city you will love, and the food scene is varied, in a good way. Great ideas – we really enjoyed the high line and I enjoyed walking thru Columbia to get to Grant’s tomb. So many different architectures in the city. Amazing. There is so much to do, in so many different seasons. It is just fun. I have not been in way too long, this make me want to go back. I have seen most things here and usually go for 3 days, but still have not made it to the Statue of Liberty cause of the lines. 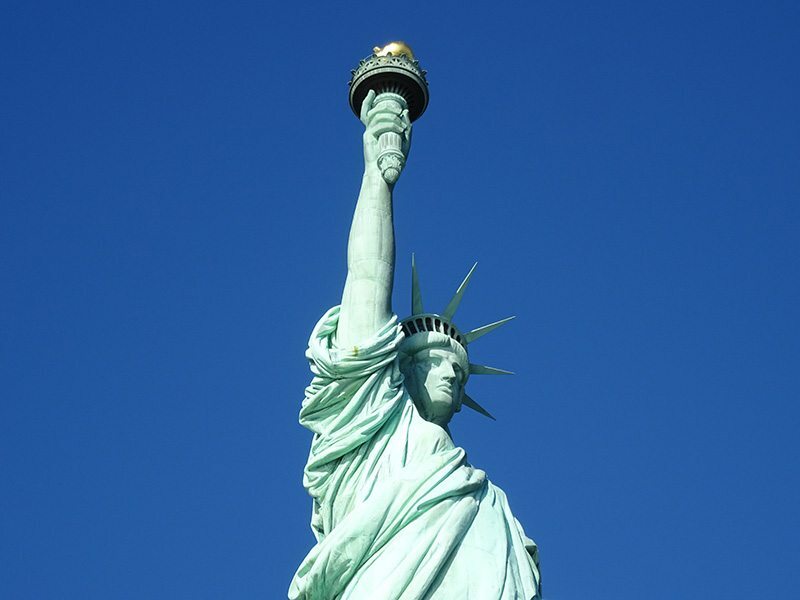 I don;t necessarily think the Statue of Liberty is worth wasting the time in the queues. I would rather wander the back streets. Oh Paula that sounds like an amazing way to spend 3 days. You are certainly giving us inspiration to visit the US. 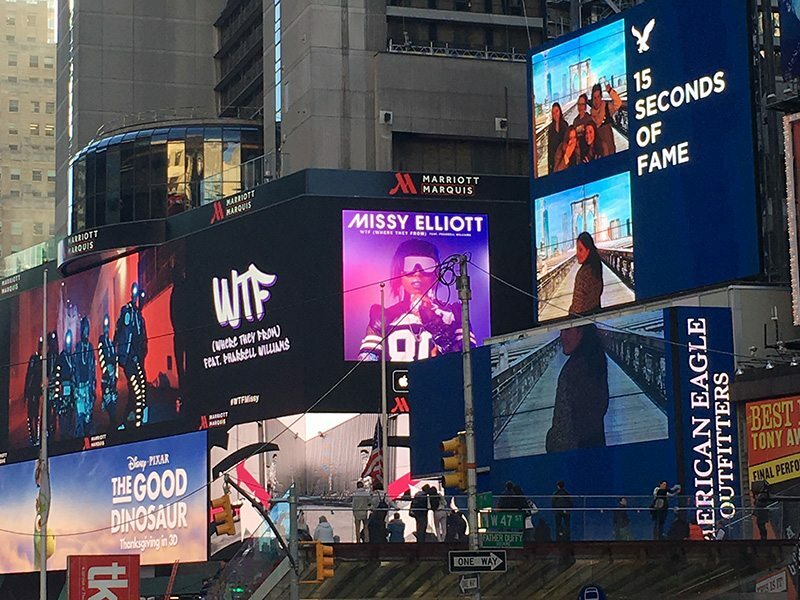 It is very different unique, and a place that it very user-friendly, though I did relate to every movie and tv show that I have ever seen that was set in NYC. Terrific guide. So comprehensive. We have one night in New York on our upcoming trip so maybe I need the edited version – lol. I think I could do a 24 hour guide, based on what I think would work. On to that. This sounds like such a fun way to spend three days. 🙂 I’d especially like to see Ellis Island. It is a place with so much to see and do. 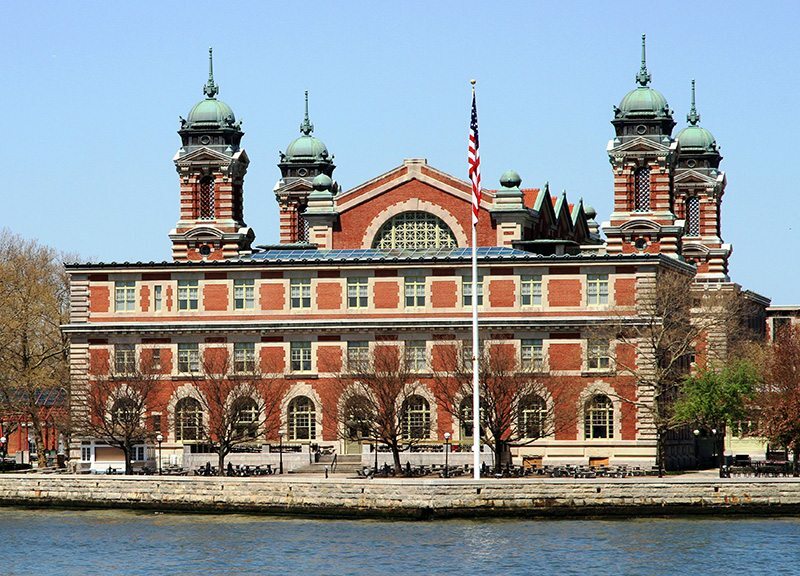 Go early or really late to Ellis Island, to avoid the queues. Great tips.. I am looking at going to NYC in Nov 2017 and am always on the look out for ideas of what to do, even though I’ve been there before. I didn’t know that about Newark taxis. Also I have been looking at accommodations for NYC and The Paul stood out to me as well – great minds.